Glary Utilities Pro is a powerful and top all-in- one utility to fix, speed up, maintain and protect your PC. It optimizes the performance of your computer, solves problems, protect your privacy and helps you to customize your system to suit your needs. Glary Utilities Pro does a great job of keeping all my PC’s running smooth. I highly recommend it. And how can you beat the free Pro version. Try it…you’ll love it. Here’s your Christmas present 9 months early this year. I have used it for years as my GOTO Cleanup. Many tasks included that you will use and some that you will not need. Simple. Use what you want. Registry a mess, clean it. Truly 1 of the 5 best system Utils. I trust Glary Utilities Pro above all other similar products and have been using it for several years. Keep up the excellent work! And thank you. I have used this program for years, and it is one the the best out there for your computer! It helps keep my computer running smoothly and problem free. Great software. If you have it installed and updated from earlier give aways, get it from here anyway, and use the new license code to extend your pro license for a year! Been a Fan of Glary Utilities for years. Its solid. The one click cleanup is thorough and couldn’t be much easier to use. And the various tools are really handy. Its my go to app, when things get sluggish. Getting the Pro version for free is a deal, that should not be missed. Wowzir! Good clean programme that is easy to use and does what I cannot otherwise! Thanks for the chance to explore it. Its not an easy job to keep the PC in good health and avoid possible drop in performance. Moreover, with a lot of tools claiming to fix and speed up your PC, it is difficult to figure out which one to choose and which one really works. 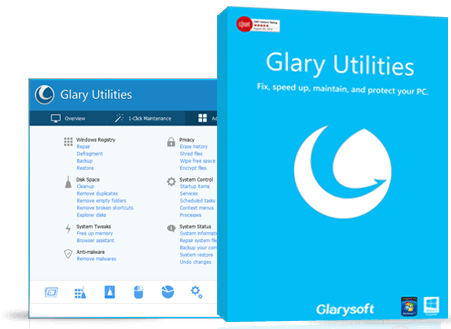 Glary Utilities Pro is a software application that comes packed with neccesary tools to help you speed up, clean up, and maintain your PC. With this application you can easily free up disk space, clean the registry, manage the drivers, tighten up privacy and maintain security on your PC. The installer is only ~16MB in size and the installation process is quick and simple. After launching it, you can straight away start exploring different tools and options that can help improve your PC performance. It contains over 20+ tools that are designed to fix, speed up, maintain and protect your PC. The interface has a modern look, and consists of small and easy-to-use window. There are 3 tabs, namely ‘Overview’, ‘1-Click Maintenance’, and ‘Advanced Tools’. The ‘Overview’ tab shows Windows boot time, gives license, database and version information, and contains a few option like turning on automatic maintenance and clean up etc. ‘1-Click Maintenance’ tab contains options that you can tick/untick as you wish to, these options determine what would be scanned and fixed by the 1-Click Maintenance tool. ‘Advanced Tools’ tab is more suitable for the advanced users, it contains all the tools categorized into different categories for easy access. Under the window is a toolbar with different tools being represented by icons, this is more suitable for the novices as it is easy to understand. With this tool you can scan your PC for incorrect registry entries, invalid shortcuts, startup entries, temporary files, history and Internet traces, spyware and adware. This tool can free up hard drive space by removing junk files, it can improve performance by fixing errors in Windows registry items and system. This tool can also defrag Windows registry. This tool can also help you uninstall and get rid of the applications that you no longer need on your PC. You can monitor system startup, context menu entries, and optimize RAM usage. This tool also takes care of privacy on your PC, it can remove history, cookies and traces from your web browsers, use a shredder to permanently delete files beyond recovery, encrypt and decrypt files. Moreover, it can analyze disk space usage, locate and delete duplicate files, remove empty folders. This tool takes up a lot amount of system resources and all it’s tools work well and smoothly on the system. I did feel a bit improvement in my PCs performance and it actually did improve the Windows boot up time a lot. I really love this feature, because actually it let’s you fix, clean, and maintain your PC in just one click. It is best for people, who are busy working on their computers for hours and have no time to tweak with different tools and features. Glary Utilities Pro is a lightweight yet powerful utility, packed with 20+ useful and premium-like tools designed to improve your computer’s performance by providing an all-in-one tool for maintaining and monitoring the health of your computer. It is definitely one of the best system maintenance tool I have come across. It is recommended for all the users who need a reliable and powerful software utility to help fix their PC. Long time fave from get go. Glad to see this version. Glary seems to crank out new versions all the time so 1-year license no issue. As others say, the Updater function is one of best. Makes it a snap to keep up on chosen updates from the list it makes. Along with free Wise Uninstaller, this belongs in toolbox. Thanks for the review. I realize it is over a year old so am not sure if you will see this or not but, if so, I wanted to ask a question. You say you like the 1-Click Maintenance, as do I, and I am curious, do you let it clean your registry? After the scan but before the cleaning, I uncheck “Registry” despite GU showing 100+ issues as I am always leery of touching that part of the pc and creating a problem. Just wondering. Thanks in advance. Glary Utilities Pro has one very important feature—it scans your installed software & notifies you when updates are available, then it can download them for you, too. Considering how important to security keeping software updated can be, this is a great feature & makes this a good program to have; I think it’s important enough that I have a license for that reason alone. Glary does many of the same things others do, but has been around a long time and seems to do it better. Getting the Pro version for free is truly a great deal. I love Glary! Thank you, Dennis, for your nice review. However, I’d like to correct matters or differ on certain key points. Variety of tools: Although the criticism is made that there are *too many* tools in Gary Utilities Pro, the fact is, it’s good to have all those options in 1 place. And if a particular user doesn’t want or need a tool (but you could in the future . . .), the answer is simple: simply don’t use it and ignore it. Easy access to tools: The criticism is made that the interface is “clogged.” First, I don’t find that issue–the interface is clear, but simply has many options. Users will locate and learn what they use most. But if there are only a few tools that a user uses and if the user doesn’t want to go through the interface, one can create a shortcut for the specific application one wants under the installed file folder and the specific application file, and put the shortcut on one’s desktop or Start menu. Useful, innovative tools not built into Windows: Finally, I simply don’t understand the criticism that Gary Utilities Pro only has a couple of features not already in Windows. File splitter and File undelete are identified. And then I routinely use File Shredder (to eradicate any evidence of a file) and Disk CleanUp (cleaning out, with one click, trash and unneeded files throughout your PC–try it and you’ll likely be surprised by what is found and the space that you gain, even after having run Windows cleanup utility). And going through Glary’s Advanced Tools screen identifies many other utilities which I don’t believe have a counterpart in Windows. The short answer is: there’s lots here that’s not in Windows, the reason the software is so valuable and useful, and I’m always discovering more. Buying your first personal computer is an exciting experience. However, you will soon have to deal with many utilities and computer management tasks like software updates, driver installations, disk checks, searching for files, and removing malware. If you are an average computer user who just owned one, Glary Utilities Pro should be your software of choice. Glary Utilities Pro has many computer maintenance features that users require on a regular basis. Once you install the application, you will access features like disk space analyser, uninstall manager, registry repair, startup manager, process manager, and memory optimizer. With such a collection of tools, you may not need individual applications for specific tasks. The application provides a one-stop location to access most tools that PC users need on a daily basis. That is an exciting thing especially to users who find it challenging to locate such tools from the Control Panel. There is a 1-Click Maintenance tab with various options like Registry Cleaner, Spyware Remover, Startup Manager, and Temporary File Cleaner. You only need to select the option you need and start scanning. Although it might be a good thing to some, the maintenance tools that Glary Utilities provides are too many. You may have to go through the features every time you need to use one. The many features and options on the main screen make the interface uninteresting. The application only has a couple of features that do not come pre-installed in Windows. File Splitter and File Undelete are some of those. Glary Utilities Pro is best suited for average computer users. Most of its features are inbuilt in Windows in which they are more reliable. I have been reading your reviews for some time now and I have come to the conclusion that you are not actually testing the software out. This is a review from someone skimming over a webpage, reading some features, and looking at screen shots. I could have made a better review by making stuff up, or is that what you are doing. This review should have been so much more in depth. Interfaces do not have to be interesting, this is not a movie… Anyways if you are going to write a review then you should actually try the software out. I have used Glary for a very long time and am always pleased with the results. A loyal customer. Glary Utilities has been one of the few products I have used consistently and reliably for years. I bought a license for all of my home computers, and have never regretted it.